Ginger is a wonderfully spicy to cook and bake with, and the fresh root can easily be grated into everything from sauces to cake batter. But candied ginger is my favorite way to put this spice to good use. 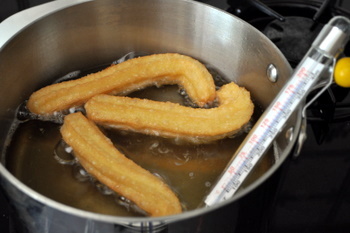 Candied ginger is ginger root that has been cooked in a sugar syrup until it becomes sweet and tender. 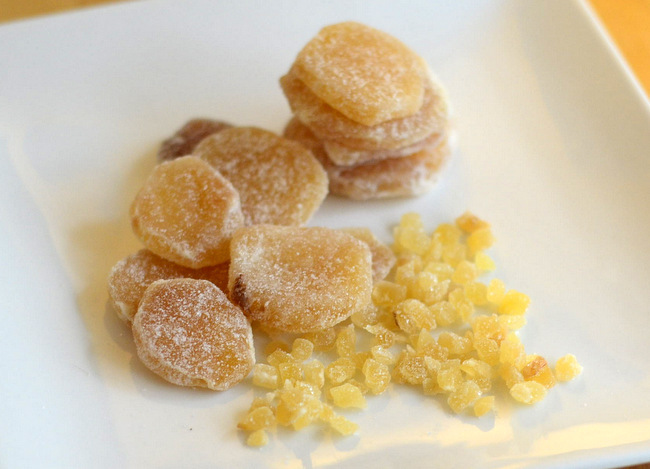 Candied ginger retains its gingery bite, but it takes on a sweetness that ginger just doesn’t have by itself. Once prepared, the ginger can be used as it is, or it can be dipped in sugar to add a crisp, sweet coating. Once it has been dipped in sugar, the candied ginger is sometimes called crystallized ginger, though generally the two terms are used interchangeably. My favorite way to use candied ginger is chip form, where the root is cut into pieces that are approximately the size of a chocolate chip. This size is easy to incorporate into a wide variety of desserts, from cookies to ice cream to cake to candy bars, because it stirs right into the batter. If your pieces are larger, simply cut them down using a chefs knife. Combine candied ginger with ground, dried ginger for when you want to add extra heat to a mild ginger base or to fresh ginger when you want to add some sweetness to contrast with the heat. Candied ginger can be found in many grocery stores in the spice aisle, but this is not where I recommend that you buy it. The quantities of candied ginger that can be packed into a small spice container are tiny – often not enough for most recipes – and the price tends to be quite high. Instead, look for candied ginger online, where you can buy it from specialty stores in bulk for much less. Natural food stores sometimes sell candied ginger in large chunks or slices for a bit less than you’ll find the chips at grocery stores. Besides baking, candied ginger is an EXCELLENT remedy for an upset stomach and/or nausea. Pregnant women, buy a container and keep it with you – it saved us ALL from that awful green feeling. Great for those time when you overeat, too. Nibble on a little as an apres dinner treat and you will feel much better! I get my candied ginger at my local asian grocery store and use it in all kinds of sweet and savory recipes. I love ginger! Candied ginger is good enough to eat straight up but it’s great in things too. Can’t get enough of that and cinnamon in my life. I’ve made Ginger-Cinnamon Pear Preserves before. Ginger being the crystallized ginger cut into tiny pieces…they were so good! I’ve never used candied or crystallized ginger in anything, I’ll have to try it out. Do you recommend anything particular recipe? The only thing to emphasize is to get the freshest ginger you can. I had two big pieces and one wasn’t quite as fresh as the other… the result was a little more fibrous. Now I have a batch I can’t stop eating it!! Courtney – That’s great! There are several recipe suggestions in the “Related links” list below the post! Bobby Deen (Paul’s younger son) shared a recipe for a lighter version of sweet potato biscuits!! My brother has challenged me to make some for Thanksgiving. I am NOT a biscuit maker. And the recipe calls for candied ginger. I did not have a clue what candied ginger was! Google directed me to this site, and I have now learned something new! Now…on to the super challenge — I have two weeks to learn how to make biscuits! !